The world of dentistry is constantly evolving for the better. At Dental & Cosmetic Solutions, Dr. Horokhivska and Dr. Pastouk are committed to keeping up with the latest developments for the sake of their patients, which is why our Pepper Pike, OH office is outfitted with state-of-the-art tools and techniques. We’re proud to improve the speed, comfort, and accuracy of your dental care experience from beginning to end! Please don’t hesitate to contact us today if you have any questions, or if you’re ready to schedule an appointment. Sleep apnea is a serious health problem that can rob patients of a good night’s rest again and again while also harming their overall health and wellbeing. 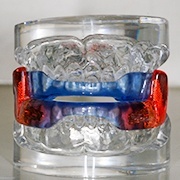 What most people don’t know, though, is that a highly trained dentist like Dr. Pastouk can provide effective sleep apnea therapy in the form of a Mandibular Repositioning Device. Gum disease affects nearly 50% of all adults in the United States. Think about it – one out of every two people (maybe even yourself) is suffering from periodontal disease. At Dental and Cosmetic Solutions, we use our state-of-the-art soft tissue laser to remove gum disease entirely and help patients enjoy renewed, healthy smiles. This technology is different from traditional methods such as scaling and root planning and is much safer and comfortable for patients. Bleeding and swelling after treatments is greatly reduced, and recovery is also exponentially quicker. 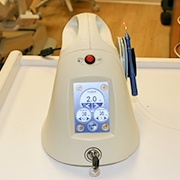 Our soft tissue laser also helps new, healthy tissue grow – rebuilding your oral and overall health. If the idea of visiting a dentist’s office makes you feel nervous or fearful, rest assured that you’re not alone. 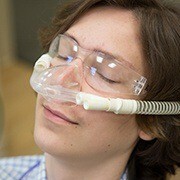 At Dental & Cosmetic Solutions, our team strives to help every patient feel fully comfortable, and nitrous oxide sedation (“laughing gas”) is available as needed to help you reach a genuine state of relaxation. 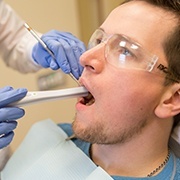 Intraoral cameras allow patients to rest comfortably in the treatment chair while also getting an up-close-and-personal look at the inside of their mouth! These real-time images are captured by a camera-tipped wand that our team inserts past the lips and transferred to a convenient monitor in the room. This makes it easy for our team to not only maintain more comprehensive and accurate records of your oral health, but also more clearly explain any dental concerns you’re facing. 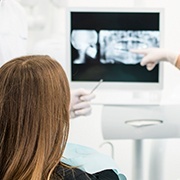 X-rays are an essential part of quality dental care because they allow our doctors to identify damage and decay that may be hidden under the surface of your teeth and gums. Instead of relying on traditional X-rays (which required a darkroom and hazardous chemical use), we’ve invested in digital radiography that comes with several valuable benefits. Instead of having to wait for the images to develop, these X-rays are immediately accessible on our computer system. In fact, they can be magnified, rotated, and even color-coded in order to help patients better understand what they’re looking at. This technology also exposes patients to much less radiation than traditional film by up to 50%-90%, which is safer. While X-rays are extremely valuable for diagnosing a wide variety of dental health problems, there are limitations on their scope. When our doctors are planning advanced procedures like surgical implant placement, we want to make sure that our approach is as precise and successful as possible, which is why we utilize revolutionary 3D Cone Beam imaging. 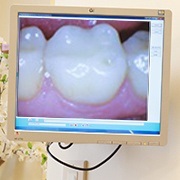 This technology creates a panoramic, three-dimensional view of the patient’s teeth, jaw, skull, and more. In fact, the detail so exhaustive that we can even locate the locations of certain facial nerves!